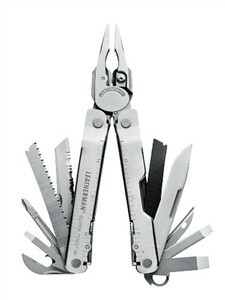 The heart of any multi-tool is the pair of pliers at the core. If that's cheaply made, you'll break the tool and go on to something else. The original Leatherman Super Tool lasted many users for fifteen years or more, and the Super Tool 300 is even stronger with slim profile jaws that fit into tighter places. The stainless steel handles have contoured sides for a more comfortable and therefore more powerful grip, and the access cutouts in the handles are larger. Even with gloved hands, you can get the blades out. Tools and blades lock into working position for safe, controlled use. The Leatherman Super-Tool 300 holds 19 tools including file, saw, flat and Phillips screwdrivers, crimpers, and insulation strippers. Also included are wire cutters for both stranded and solid wire, and in this model, the cutter blades are removable. If you've buggered them up on the job site, it's possible to remove the jaws and re-sharpen them on the spot with the file the same multi-tool provides. Among the other tools in the Super-Tool 300 are the old standards of bottle opener, can opener, and awl -- seldom used today but always available in a pinch. The Leatherman Super-Tool 300 comes with a combination leather and nylon belt sheath, built in a pouch style with a snap-flap closure. For a tactical style multi-tool built for heavy duty tasks, see the SOG Power Assist Multi-tool.